What is ‘special’ about Glannau Ynys Gybi SSSI? Precambrian rocks exposed in coastal cliffs and inland outcrops. An assemblage of scarce vascular plant, including pale heath violet, golden samphire, rock sea-lavender and Portland spurge. As well as the features listed above, Glannau Ynys Gybi SSSI has other habitats/earth science features that contribute to the special interest. These include scrub, ponds and rock outcrops. This mixture of habitats is important for much of the wildlife including juniper, hay scented buckler fern, filmy ferns along with skylark, linnet, brown hare, a breeding seabird colony with razorbill, guillemot, puffin, fulmar, kittiwake and potential for the return of marsh fritillaries. Other features of interest include rockpools, overhanging rock, gullies and underboulder communities and their associated flora and fauna. These too are key components of the special interest of the site. Unless specified below, management of this site should aim to look after these habitats and species as well as the listed features of interest. What do we want Glannau Ynys Gybi SSSI to look like? 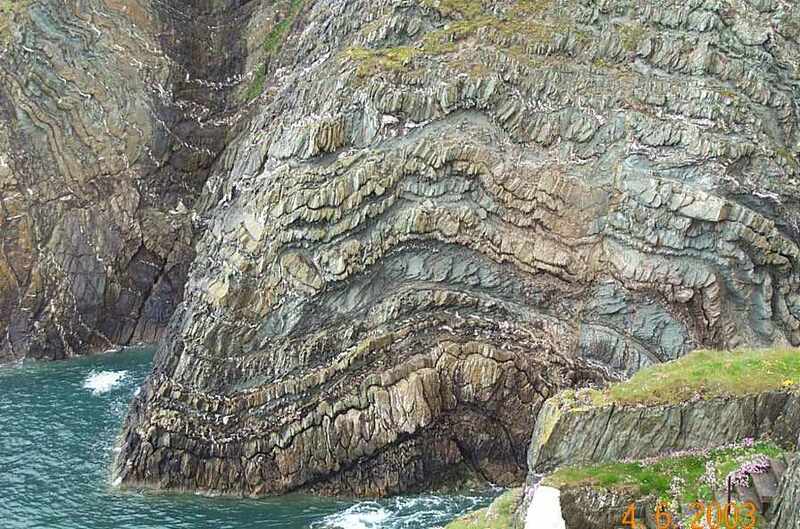 The cliffs around South Stack display some of the most magnificent exposures of folded rocks in Britain. They are particularly important to study the effect of folding and fractures on different rock types. The exposed geology of the site should continue to demonstrate fine exposures of folded Precambrian rock. These geological features should remain visible and accessible to geologists. The vegetated coastal cliffs should remain largely undisturbed and support the endemic South Stack fleawort, golden samphire, rock sea lavender, hay scented buckler fern, juniper, ciliate strap-lichen and golden hair lichen. At least 70% of the site should be covered by lowland and coastal heathland. The habitat should be of good quality characterised by of heather and western gorse with crossed leaved heath, deer sedge and Sphagnum moss in wet areas, spring squill near the coast and abundant short turf and open ground. It should provide habitat for a wide range of birds including skylark, linnet, stonechat and whitethroat, reptiles and insects including the silver studded blue and the potential for marsh fritillary to re-establish. Sixteen pairs of chough currently nest on the cliffs and a breeding population of this size or greater should be resident, aided by management of feeding zones in the surrounding area. A breeding seabird colony with guillemot razorbill and puffins along with fulmar, kittiwake and peregrine, should be maintained. What management is needed on Glannau Ynys Gybi SSSI SSSI and why? Although Glannau Ynys Gybi SSSI is an excellent place for wildlife and geology it will only remain so if the necessary management continues. CCW’s aim is to work with you to ensure that this management is carried out. Students and researchers need access to study the rocks exposed around South Stack. 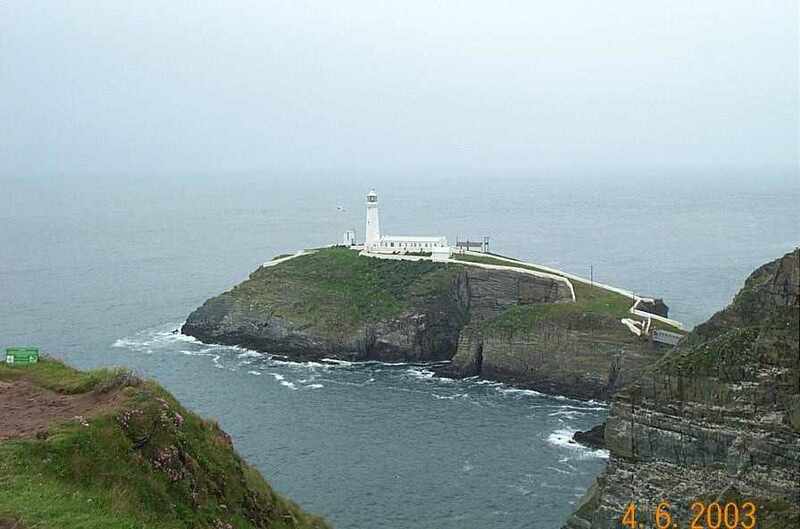 Access should be maintained to the coast and heath at South Stack, including South Stack island and steps, in so far as this does not conflict with breeding birds. Any activities that might obscure the rock exposures, for example the dumping of earth, spoil or other waste materials, the buttressing and/or battering of the rock faces, or building works such as new steps should be avoided. Discourage any “cleaning” of vegetated new routes by climbers. Maintain absence of livestock (especially goats) on cliffs or very light grazing pressure as appropriate. Low soil fertility helps heather and western gorse to compete against more aggressive agricultural grasses. Light grazing encourages the development and maintenance of dwarf shrub heath. Cattle and horses are to be preferred as they are less selective in their grazing than sheep, permitting more plants to flower and set seed, whilst also breaking up dense clumps of gorse (although sheep may be better than nothing for a time). They also produce minor poaching of the ground enabling seedlings to establish and providing a feeding niche for chough. Grazing animals help create natural firebreaks. Maintain light grazing wherever possible. Periodic heavier grazing may be required on a spatial or temporal patchwork to meet chough requirements (4.4). Grazing may not be possible in certain areas or at certain times due to constraints such as health and safety, stock control problems etc. Controlled small patch burning rejuvenates heather and gorse, can help reduce soil fertility and provides microhabitat for spotted rockrose, silver studded blue and feeding chough. Uncontrolled large fires, particularly in summer, damage invertebrate and reptile communities and re-establishment becomes difficult. Undertake controlled patch burning where appropriate and feasible given the constraints of thin soil, invading bracken, weather conditions, health and safety and adjacent properties. Mowing small patches may be used as an alternative to burning where appropriate. Mown or back-burnt firebreaks may be necessary. Maintain up to 5% scrub cover in small blocks on heathland. Caves and sheltered ledges provide nest sites. Ensure undisturbed breeding caves and ledges during the breeding season. Short unimproved turf that provides accessibility to soil invertebrates is vital to support chough. Cloddiau are important feeding sites. The maintenance of the breeding population of chough may require feeding areas beyond the present boundary of the SSSI. Outwinter livestock wherever possible and avoid use of Avermectins in order to provide dung suitable for insects. Establish appropriate grazing levels. These may be higher than normally required for heathland maintenance and a programme of heavier grazing with periods of recovery years on a patchwork pattern may be required. Maintain accessibility to cloddiau by encouraging bank top fencing rather than basal fencing. Requirements as for heathland. Flowering plants of spotted rockrose are susceptible to sheep grazing in summer. Avoid sheep grazing on rock rose areas in summer. Breeding seabirds require secure nesting sites, free from human or predator disturbance, and a reliable food supply. Nesting occurs extensively on the steep southern slopes and ledges 1 February to 31 July. Maintain voluntary restraint agreements with climbers, canoeists etc. Nesting seabirds require a regular supply of food available to foraging birds within a short distance of the colony. Any actions or events likely to impinge on this resource should be resisted. Maintain voluntary restraint on route “cleaning” by climbers. Avoid fire on thin maritime turf. Maintain early heath succession phase by light grazing and/or controlled burning. Maintain controlled patch burn regime. Our knowledge of wildlife is far from complete. It is possible that new features of value may appear and new management issues may arise in the future, whilst other issues may disappear. This statement is written with the best information we have now, but may have to change in the future as our understanding improves. Any information you can provide on the wildlife of your site, its management and its conservation would be much appreciated.